Earth Grown Crayons are handmade, biodegradable and Eco friendly soy crayons shaped in designs that celebrate this earth's wonderful treasures. 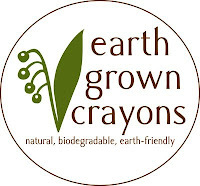 These natural nontoxic soy wax crayons have a frosty matte appearance to them that goes away when held in a warm hand. Soy crayons glide on smoothly creating a creamy texture while you color. Leaving behind a beautiful picture. I know when I color I like bright beautiful colors not dull. That's what we got with these crayons bright beautiful colors. The only I disliked about these crayons is how small they were. I would like to see them be just a little bigger, I think that would make easier for smaller toddler hands to use. These crayons would make a great gift for a child's birthday or to put in a goodie basket. You know Easter is right around the corner these would make a great item to add to your kid's Easter Baskets. Stop by their website and check out all the different designs available, and pick some up today. These are cool! I like the fun shapes. There is a restaurant that we go to that has Soy Crayons. I don't mind them at all because Big Sis still puts them in her mouth sometimes. I love the different shapes. I think my grandkids would love these. These are neat! I agree with Kay, the different shapes make them even more fun, but they would be better if they were a bit bigger. I think these look great. I had never heard of soy crayons before and think that these look like great starter crayons for little ones working on their fine motor skills! Thanks for sharing.